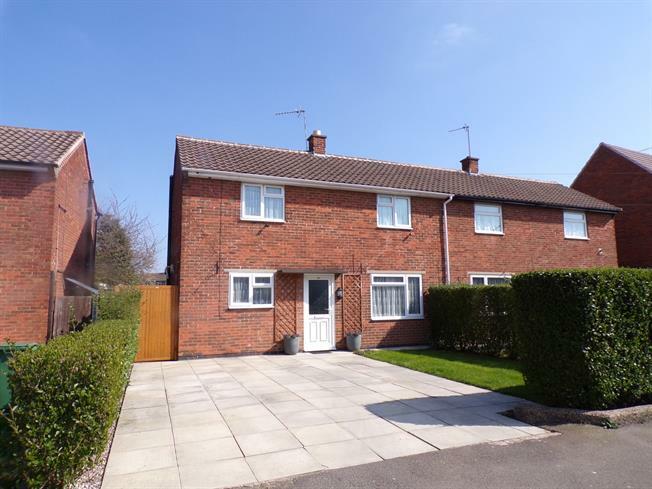 2 Bedroom Semi Detached House For Sale in Wigston for Offers Over £190,000. Formerly a three bedroom property bedrooms two and three have been converted into one large master bedroom, there would be a option to revert back to three bedrooms. This lovely home is extremely well presented and provides comfortable living space with a stylish lounge and sunny conservatory, kitchen breakfast room with French doors opening out onto the patio, two double bedrooms and a modern refitted family bathroom, Mature and extensive gardens to the rear and separate garden which would make a fantastic vegetable garden. Having Upvc door to the front elevation opening onto the driveway. UPVC French double glazed door. Double glazed uPVC window facing the front. Radiator and open fire, laminate flooring. UPVC double glazed door, opening onto the patio. Double aspect double glazed uPVC windows facing the rear and side. Radiator, laminate flooring, exposed brick. UPVC French double glazed door, opening onto the patio. Double glazed uPVC window. Radiator, laminate flooring, under stair storage. Roll top work surface, wall and base units, one and a half bowl sink. Double aspect double glazed uPVC windows facing the front and rear. Radiator. Dressed with 1940's decor. Double glazed uPVC window with obscure glass facing the rear overlooking the garden. Heated towel rail, vinyl flooring. Low level WC, panelled bath, electric shower, vanity unit and wash hand basin. To the front of the property is a paved driveway providing parking for several vehicles, small side lawn enclosed by hedging. Side gated access to the rear. The rear gardens are substantial and mature with a well maintained lawn with stepping stone pathway, feature pond with further wildlife pool, borders filled with established plants and shrubs, patio seating areas, chalet style shed, further gardens beyond which would make a fantastic vegetable patch.